You Need A Budget (YNAB) is a personal finance software with strong financial budgeting features. The software runs on Windows or Mac computers and has a mobile version for checking your budget and entering transactions when you're not using your computer. The mobile apps synchronize transactions entered on your smartphone or tablet with the desktop software using Cloud Sync. The YNAB software has been laid out in an easy, intuitive format. The scheduled transactions tool collapses unless you want to use it, and accounts used for budgeting, off-budget and closed accounts collapse on the sidebar. You Need A Budget is based on the idea that you should have savings set aside to dip into when unexpected expenses come up, and the software helps you to build this financial cushion if you don't already have it. YNAB also helps you move toward paying down and being free of all your debts. Details at the top of each month column on the budget screen show you money that was not spent and was rolled forward from the previous month, the total overspent in all spending categories the previous month, income that's been received to-date for the current month, and the total amount budgeted in the current month. To keep this information useful, you will need to enter or download transactions every few days or at a minimum, once a week. YNAB automatically saves changes frequently while you're working in the software using Cloud Sync. This feature requires a free DropBox account, and you can share data across all of your computers and use YNAB on any Windows or Mac computer you own. These backups also make it possible to easily roll back to previous data if you mess something up. YNAB doesn't offer a ton of reports, but it does include some very useful reports since the software offers decent options for customizing the data by timeframe, budget categories, payees and accounts. 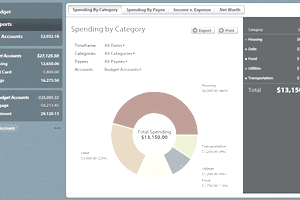 The software offers ready-made reports including Spending by Category, Spending by Payee, Income vs. Expense and Net Worth. You can click on slices of a pie chart to get more detailed information, and you can print the reports and export the report data to other programs, such as Microsoft Excel. You Need a Budget has a low-cost plan; if you opt for the monthly payments, it costs $6.99 per month. You can sign up and pay for the annual plan, but it's $83.99 a year, so you might save time but you won't save any money by paying for a whole year up front. YNAB also offers a free 34-day trial for new users. For college students, you can use YNAB for free; just upload proof of your school enrollment and the company will waive your fees.